A journey from gender confusion to self-acceptance. Not everyone identifies as male or female. Chris Ricketts always knew she didn’t fit comfortably into either category, and her doctors agreed. But Chris rejected the radical surgery and hormone therapy she was offered, because she felt there was nothing about her that needed to be reassigned. Instead she went on a spiritual journey to find her place in a world that appeared to have no place for her. For Chris, finding self-acceptance meant questioning the labels we give one another and having the courage to contradict society’s expectations. On a search for peace of mind that was at times both painful and incredibly rewarding, Chris came to understand that she was not living in the wrong body, that she was not an anomaly and, most importantly, that gender is a spectrum. 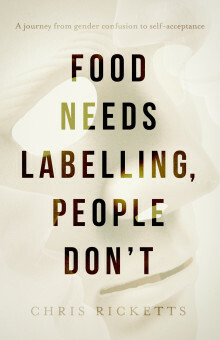 Food Needs Labelling, People Don’t is the fascinating story of how one person learned to accept gender fluidity in the face of a society that tried to make her choose.